SANTEE (3-22-16) — The Santana Sultans defeated the Brawley Wildcats 5-2 in a 5A Division game in the 66th Annual Lions Club tournament on Monday (Mar. 21) at Sultan Field. Offensively, REECE HERNANDEZ went 2-for-2 with 2 runs scored and a stolen base to be the offensive leader. TRISTAN SALINAS was a stud on the mound going the distance for the complete game victory. In the victory, he got nine strikeouts compared to one walk and a pair of hit batsmen. The Sultans (5-1) came out of the box quickly putting two runs on the board in the first. Salinas led the game off with a single. Hernandez singled to put runners on the corners. Hernandez stole second to get two runners in scoring position. NOAH NUNEZ hit a sacrifice fly to left to score Salinas. After another fly out, NIK MORA walked. JERRY ALESI singled to load the bases. AIDAN RASMUSSON walked to push across Hernandez and a 2-0 lead after the first inning. The same suspects put another pair of runs on the board in the second. Salinas walked to lead things off. Hernandez singled to put two runners on. 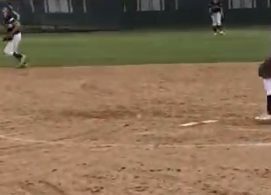 A groundout moved both runners up 90 feet. JACOB ODENKIRK singled to right center to drive in both runs in the inning and make it 4-0 Sultans. One final run was put up by Santana in the fourth. MITCHELL MILLER walked to open the frame. A failed fielder’s choice by Salinas put two runners on with no one out. Hernandez walked to put Sultans at each station. Odenkirk had some excellent vision looking at a close pitch to make it 5-1 Santana after four innings. Brawley (2-5) scratched another run across in the seventh. Tuesday (Mar. 22) the Sultans will face Mira Mesa in Santee. First pitch will be at 3:30 p.m.
STEELE CANYON 16, UNIVERSITY CITY 0 (5 inn.) – For the second time this season the Steele Canyon Cougars unloaded a 16-run attack in Monday’s (Mar. 21) 6A Division game of the 66th Annual Lions Tournament at Steele Canyon against visiting University City. AVERY TUCK, a highly regarded pro prospect, enjoyed his most prolific day with the bat for the Cougars, going 3-for-3 with 4 RBI. Tuck followed two first inning walks with his first home run of the season. Tuck’s drive went off the glove of the right fielder into the beyond. A 3-run double by JASE RUSSELL keyed a 5-run second inning for Steele Canyon (3-3). TREVOR ROW capped the uprising with a 2-run double. Steele Canyon turned the game into a blowout with a 7-run third inning. Tuck stroked an RBI triple, TANNER LOGAN plated 2 on a base hit. Pitcher LANDON SCHIRER, who rarely gets a chance to hit, was 3-for-3, including an RBI single in the big inning. KANE FIEDLER hoisted a sacrifice fly to cap the big inning and stake Steele Canyon to a 15-0 lead. 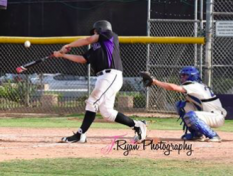 Russell, who usually bats ninth, was placed at the top of the order due to limited players available to the Steele Canyon coaches. He didn’t disappoint, as he was 2-for-4 with a double, 3 RBI and 3 runs scored. Starting pitcher Schirer blanked the Centurions on 2 hits over four innings for his third straight win. SCRIPPS RANCH 6, VALHALLA 4 (9 inn.) – A tight game was decided in the ninth inning as Valhalla (0-6) fell to Scripps Ranch (4-2) 6-4 in Monday’s (Mar. 21) opening game of the 66th Annual Lions Tournament Premier Division at Eric Turgeon Field. The Falcons Matt Rudick hurled 3 innings of 1 hit relief to notch the win. JAKE PAAPE took the hard luck loss. Norsemen center fielder BROCK MOSIER collected the first of his two doubles to begin the second inning. Walks to Paape, RILEY O’SULLIVAN and CALEB KISTER tied the game at one apiece. A catcher’s interference off COLE HOWARD’s bat scored a run and an infield single by CJ BROWN plated another. Starter CASEY O’SULLIVAN was on cruise control through four innings but ran into difficulty in the fifth, allowing 2 runs, one earned, on two singles and two walks and an error tying the game at 4, thus sending the game into extra innings. 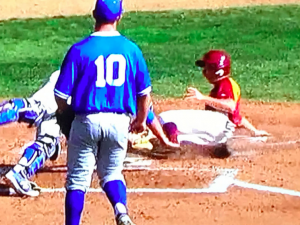 Scripps Ranch went up for good in the ninth, scoring two runs on an RBI single by Beaver and a passed ball. The Norsemen face Pacific Palisades at Valhalla tomorrow at 12:30. Torrey Pines plates a run Monday against Grossmont. TORREY PINES 5, GROSSMONT 1 – Four unearned runs and a lack of hitting led to the Grossmont Foothillers’ demise in Monday’s (Mar. 21) Classic Division of the 66th Annual Lions Tournament at Torrey Pines. The host Falcons (5-1) produced all the runs they needed in the second inning when they scored five times. Grossmont made a beleaguered attempt to come back in the fourth inning as JESSE GARCIA slashed an RBI single off the fence, scoring ADAM LOPEZ. “In reality it’s pretty hard to get only 3 hits and expect to win,” said Grossmont coach JORDAN ABRUZZO. The highlight for the Hillers was the relief pitching of KANNON ROMERO, who pitched four shutout innings and allowed only one hit. CARLSBAD 3, CHRISTIAN 2 – Veteran coach MIKE MITCHELL of Christian High was bitter after Monday’s (Mar. 21) 66th Annual Tournament Premier Division game at Carlsbad. Not at the fact that the Patriots (2-4) lost the game to the Lancers (5-1), but the interpretation by the umpires left him anything but speechless. In question were two double play balls that were not bang-bang in nature. 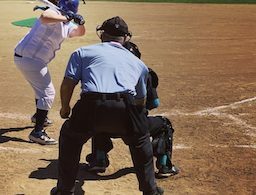 “Both times our runners had beat the throw to first but the umpire rang us up each time for some reason, because we were clearly safe by a step both times. “It was ridiculous how he could miss both plays,” Mitchell fumed. 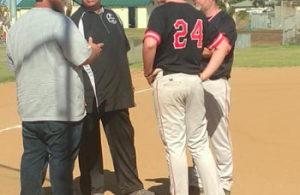 “I even had Carlsbad parents come up to me after game and apologize for how bad the base umpire was. That’s never happened before in my career where the opposing team’s parents would say something like that. The hardluck loser in this contest was NATHAN JARVIS, who surrendered 5 hits and 3 runs while striking out 5 in 6 1/3 innings. The flicker of Christian’s offense was delivered by CHASE WEHSENER, who was 2-for-3. Lombardo, Romero (3) and Hindorff. Sidney and Cappozoli. Peabody and Walker. Jarvis, Bessone (7) and Josephson. Corado, Demarest (3), Rudick (7) and Blake. CO’Sullivan, RO’Sullivan (5), Paape (6), Poe (9) and Heider. Wolkkiad, Bingham (2), Schaldach (3) and Owens. Schirer, Newberry (5) and Arias, Blethen (5). WP-Schirer (3-0). LP-Wolkkiad. HR-Tuck (SC-1) 1st, two on. Flournoy, Leyva (4) and Abutti. Salinas and Mora.